July, 2014, from 9th to 26th, driving in Garze for 18 days & passed 11 countes, with Xiaoqing, Cesar, Patricia, Luis, Leandro, Telmo & Julia. Driving, riding horse, play with children, trekking, hotsping spa, swimming, temple tour, meeting Rinpoche and new friends...So satisfied! Almost perfect! 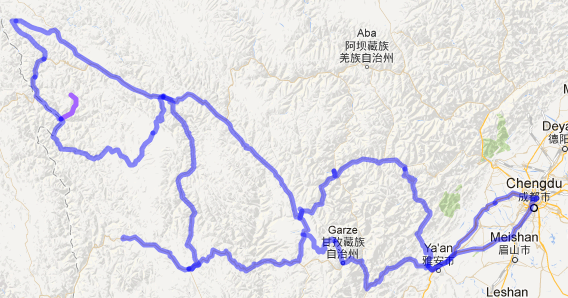 According to the restriction of google maps, if I want to display all routes well on this map, I could't upload complete gps tracks, but had to modify the tracks.